A second vicious ice storm in as many weeks caused widespread power outages in Southeast leaving more than half a million people in dark. Georgia was the worst-hit state with almost 230,000 homes and businesses without electricity, according to figures reported by utility companies at 6:45 a.m. ET. More than 200,000 customers were experiencing outages in South Carolina with 90,000 others suffering in North Carolina. Louisiana and Virginia also had thousands of people left without electricityl. Almost 500,000 Georgia Power customers alone had been off the grid, but the company had managed to restore more than half of them. The Southeast was suffering after being hit Wednesday by a huge storm that stretched from Alabama to Massachusetts. But during the night, those without power were not the only people suffering: Ice and fallen trees created dangerous driving conditions for crews trying to get people back on the grid, according to the Georgia Department of Transportation. More than 3,400 flights into and out of U.S. airports were canceled Wednesday and 3,500 more were delayed. By 3:30 a.m. ET Thursday there were already more than 1,600 US cancelations for the day, according to FlightAware. By early Thursday, the storm had begun its march up the East Coast, according to Kevin Roth, lead meteorologist at The Weather Channel. In New York, Pennsylvania, and Washington, D.C., it was expected to dump snow at a furious rate of two inches per hour, making tough work for even the most industrious snowplow crews. The freezing rain had largely stopped in the South but this was due to morph into snow in parts of Georgia and Alabama, Kevin Roth said. But with temperatures still below freezing, the ice which built up in parts of Georgia and the Carolinas on Wednesday was not expected to budge. And this was continuing to affect the states’ electricity infrastructure. 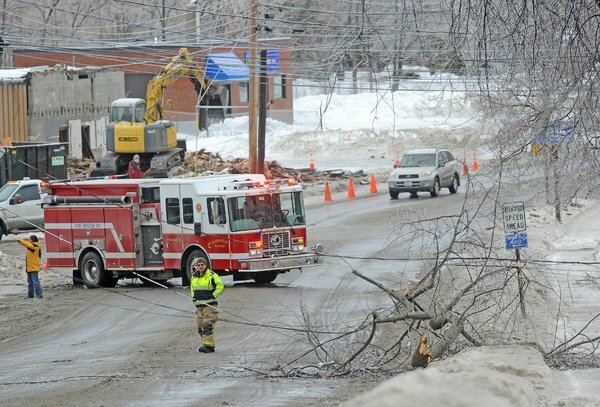 As much as an inch of ice built up in all these states, bringing down trees and weighing heavy on fragile power lines. The worst-affected areas were north and east Georgia, central and eastern South Carolina, and central and eastern North Carolina.